Austin, Texas, will be the location for the new headquarters of U.S. Army Futures Command, Secretary of the Army Dr. Mark T. Esper announced July 13 at a Pentagon press briefing. Under Secretary of the Army Ryan McCarthy then explained the details. He said that the process started with 150 metropolitan areas, narrowed down to five. Besides Austin, there was Boston, Minneapolis-St. Paul, Raleigh-Durham and Philadelphia. He added that the choice was difficult as all five had great qualities. Air and missile defense is the Army’s number five modernization priority and falls under a cross functional team, which is part of U.S. Army Futures Command. Shown here, Capt. 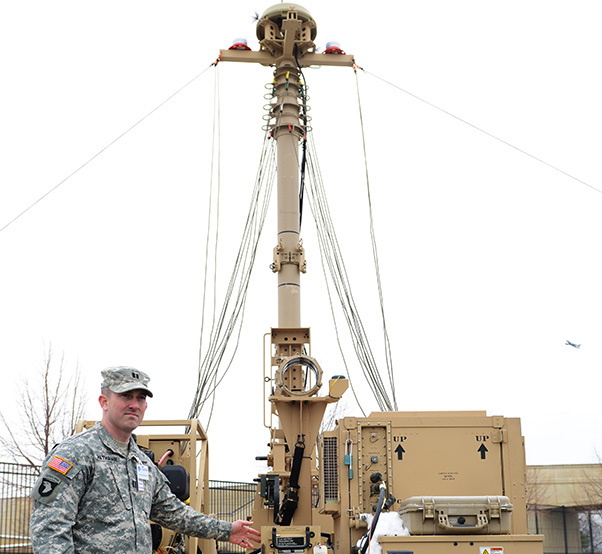 Jonathan Hathaway, assistant product manager, Integrated Fire Control Product Office, Redstone Arsenal, Ala., stands beside the integrated fire control network relay on display outside the Pentagon. The under secretary said the type of urban ecosystem defined by the selection criteria is where innovation, networking and collaboration are happening daily. “That ecosystem cannot be duplicated from behind the walls of traditional posts and forts,” he said, adding that recognition of that concept is a radical change for the Army’s culture. The selection criteria evaluation process included use of an outside firm, validated with the Army’s internal studies and analysis, as well as a federally-funded research and development center, he said. A team of six are currently en route to Austin to begin establishing initial operating capability at AFC, McCarthy said. Within a year, full operating capability will be achieved with a headquarters staff of about 500. McCarthy said that doesn’t mean all 500 will be working out of a downtown office. He said that as FOC is achieved over the coming year, he envisions teams of Soldiers and Army civilians working out of technology “incubator hubs” alongside entrepreneurs, scientists and researchers. A four-star to head AFC has been identified but not yet made public, he said. In conclusion, McCarthy said AFC will shepherd development of the Army’s six modernization priorities of improved long-range precision fires, a next-generation combat vehicle, future vertical lift platforms, a mobile and expeditionary Army network, air and missile defense capabilities and Soldier lethality. He added that the eight cross-functional teams responsible now for moving those priorities forward will fall under AFC. Col. Patrick Seiber, communications director for AFC, said over the next year, a number of existing Army organizations are scheduled to transition from other commands to AFC. The Army Research, Development and Engineering Command, or RDECOM, is one example of an organization that will eventually re-align under AFC. Army Research Laboratories, part of Army Materiel Command, will also re-align to AFC. The Army Capabilities Integration Center, or ARCIC, will move to AFC as well. Right now, ARCIC is part of Army Training and Doctrine Command. There will also be a number of acquisition and contracting elements that will fall under AFC, but those decisions are still being reviewed. While some existing Army organizations will be re-aligned under AFC, Seiber emphasized that those organizations, their employees and facilities, are expected to physically remain where they are now. The changes, he said, are “a delayering or rewiring, so to speak, to streamline functions under one command, to get solutions faster and products out to the Soldier faster,” he said. When AFC is stood up within a year, Seiber said the headquarters will contain up to 100 uniformed Soldiers and 400 Army civilians, pending plans moving forward.